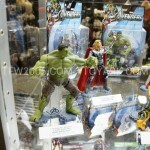 Check out photos of the Avengers toys on display at San Diego Comic-Con 2012. 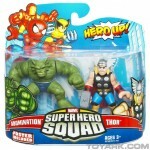 Included are 3.75′ figures, Mighty Muggs, Marvel Transformers Avengers and more. Stay on the lookout for variants too, as an Iron Man variant with the stealth armor will be shipping in even ratios! Click on the title bar to see more. Marvel has revealed an image of what might be the Skrull from the Gigantic Battles subline of Marvel Universe. Gigantic Battles sets are exclusive to Walmart, and will ship later this fall. This Skrull is to be released with the new Captain America, formerly known as Bucky and Winter Soldier. 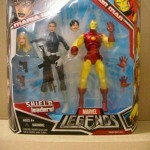 As with the Goliath figure that comes with Iron Man, it seems like the Skrull also uses an Icons body. Click on the thumbnail to the left to take a closer look! 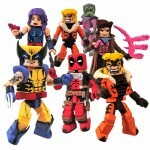 Diamond Select has sent out info, and put up a pre-order listing for series 28 of their Marvel Minimates. The set is due August 5th of this year. – Plus the variant First Appearance Sabretooth! Each Minimate stands 2″ tall with 14 points of articulation and a variety of removable and interchangeable parts and accessories. Click the thumbnail to the left to see the full size image. 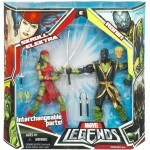 ToyArk.com has just received new Marvel Legends 2-Pack Images Skrull Elektra & Ronin. To view the new Images click the Title Bar. 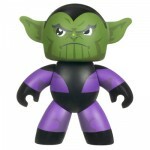 It’s not easy being green, but this frown-faced figure sure does make it look good! Whether for play or display, this hip version of the sinister-looking character is sure to bring a smile to the faces of collectors and fans alike. Confident in his large character head, chunky body – and not-so-subtle ears – this vicious villain makes a statement, looking positively posh in purple – and he’s ready to take his rightful place as a must-have for your collection!